Enhance protection for outdoor workers by shielding their neck, face and ears from the sun. 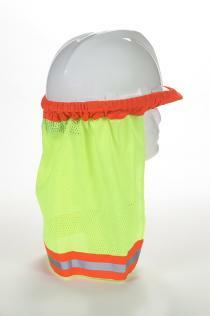 These lightweight ANSI Mesh Neck Shades block up to 99% of the sun’s harmful UVA and UVB rays. They attach easily and securely to hard hats with an elastic edge. Available in high visibility lime with 1-1/2” orange/silver/orange reflective stripes or in orange with lime/silver/lime reflective stripes.